What’s it like on our island? We encourage you to visit TripAdvisor and read from guests what they’ve enjoyed most about the St. George’s Caye Experience. There’s a reason our staff has won the Certificate of Excellence 7 years in a row! On this page, you’ll find our favorite comments to Cap’n Ron in guest surveys, and a few thank-you letters from past guests. Come see for yourself what all the fuss is about! 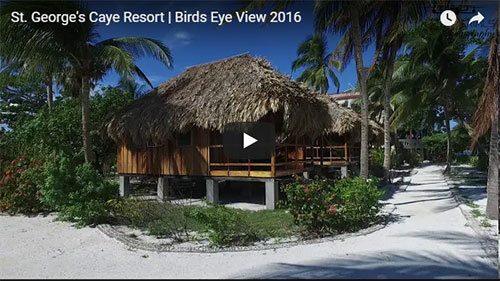 The Oregonian travel article and photo contest on St. George’s Caye Resort (20 minutes offshore from Belize, Central America), led us to travel to that destination recently. After spending an incredible 10 days there, all we can say is, Wow, what a vacation!! Customer service on a scale of 1-10 is a 15. Every employee treats you like royalty. By the end of our visit, we felt like family. The Caye is gorgeous palm trees, white sands, beautiful orchids, aqua blue Caribbean Sea, and total peace, tranquility and relaxation… Also on the Caye are some charming residents. One family has created an impressive aquarium of local sea life, and a charming documentary on their sea creatures. A few private vacation homes are to be seen on the island, too. The staff are very dedicated to excellent customer service.. The Mahogany and Santa Anna wood lodge has seven rental rooms, a cozy bar, and a large family style eating area. Available to rent on the waterfront are six large, roomy, and comfortable cabanas. They are very private and have palm leaf roofs and a lot of beautiful hardwood inside. Both lodge rooms and cabanas have complete bathrooms with lots of very soft drinkable water. Lodging package includes three complete meals a day. Breakfast usually is eggs and bacon, ham, or sausage, French toast or "to die for" Elephant Ear like deep fried bread. Breakfast also includes fresh fruit juice and fresh fruit (plantation bananas, cantaloupe, honey dew melon, watermelon, papaya, mango, and pineapple). Caribbean lunches there are commonly the traditional meal of chicken, rice and beans, vegetables, fresh fruit, and sometimes a plate of cookies. Dinners include homemade soup and homemade bread, a variety of meats, vegetables and squash, and always a delicious dessert. A bonus was a great waitress named Betty. Unbelievable SCUBA diving on the second longest reef in the world is only 20 minutes away. 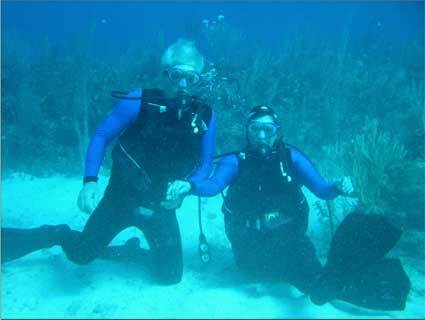 A dive master or dive instructor always accompanies divers on dives. We were extremely lucky to get Jose Flores as our dive master. We had gotten our PADI and NAUI dive cards many, many years ago and didn't know the new equipment. Jose gave us a checkout dive on a beautiful sandbar near the reef. He demonstrated and got us comfortable with the BC, regulator, and proper clearing of mask techniques. He had the patience and skills to guide us to become good divers again. Following that, we were off for seven dives in 10 days with Jose. We saw beautiful colored angelfish, parrot fish, schools of snapper and many others. One day on the reef about 35' deep, we had a large turtle swim right by us, go up for air, then return to swim by us again. Our last dive, we watched a smaller turtle ripping breakfast out from under a piece of coral with beautiful angelfish helping him out. We saw lobster, remora (always looking to hitch a ride), conch shells, crabs, and sea anemones. The only elusive mammal was the Dolphin. Maybe next time we'll see him. St. George's Caye Resort also arranged trips for us, at reasonable prices, to the Mayan Ruins and the Mayan Underworld Cave tubes. The Mayan Ruins trip included one and one-half hour boat ride up the river, where we saw lots of beautiful birds and miniature bats. The Ruins were amazing. We had a personal guide, taking us to all the excavated temples. Archeologists have only excavated 2% of all the ruins. The ones we saw were marvelous. The Caves included a hike through the rainforest with a guide and a 45-minute float through the caves on a large inner tube. The caves had some intriguing sites and rock formations to see and, yes, some bats. We can honestly say this was the best vacation we've ever had. The beauty and complete tranquility of St. George's Caye Resort was amazing. The resort and cabanas were wonderful and the owners and staff at the resort were incredible. They totally took care of us (even did our laundry). The diving was beyond our expectations. What a beautiful fulfilling adventure! 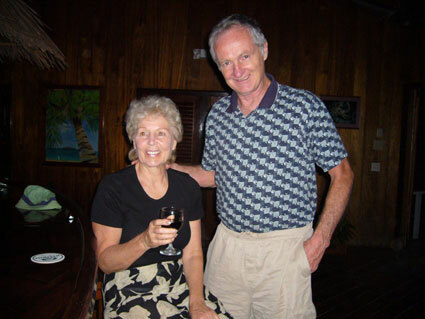 A Thank You letter to the Wonderful Staff of St. George's Caye Resort. We all were warmed by your smiles and Kindness, the way you effortlessly cared for us. Barely did wish for a thing and you had already taken care of it. It was wonderful to be in a place with happy, kindly people - to all of you our Thanks - you make this place beautiful and hospitable. And when we are back in our gray cities we will think of you with great fondness. All of you, from the kitchen to the laundry, the boats captains and the Resort staff deserve gratitude.